The division, which has four sections, covers a wide range of products and materials as follows: medical devices (dialyzers, intraocular lenses, catheters, etc. ), tissue engineered medical devices, and their materials (PVC, polyurethane, natural and biodegradable materials, metals, ceramics, etc.). Material/tissue interaction is the major subject of the research of the division. Analysis of retrieved implants and evaluation of supporting system for surgery are other subjects. Safety and biocompatibility of medical devices are evaluated by proteomics, chemical and biological techniques. Cultured cells are used for in vitro toxicological testing of medical devices and their materials. Safety, efficacy and quality of tissue engineered medical products are also studied. Safety of tissue engineered medical devices using normal human mesenchymal stem cells is evaluated. 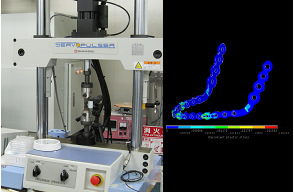 Mechanical properties of implantable materials for medical devices are evaluated utilizing a fatigue test, a wear test, and their computer simulation.